×MSU Greek Week 2016 is not accepting donations at this time. The four councils of Michigan State Greek life coming together to support the Greater East Lansing and Lansing Areas. Check out the MSU Leaderboard to see which Greek Week Teams are in the lead! Every winter, a sorority and one large and small fraternity collaborate to form a Greek Week team. Each team then competes against one another in activities to raise money for specific charities. Teams spend a great deal of time practicing for the three main competitions, MTV night, Songfest, and Greek Field Events. MTV Night and Songfest are all music and dance oriented competitions where members from each team showcase their skills and perform based on their chosen theme. MTV Night features the more skilled dancers and focuses on technique. Songfest is also a dance competition but less technical and lets more team members participate. This year MSU Greek Life is proud to announce the addition of the Multicultural Greek Councils Annual MGC Showcase and the National Pan-Hellenic Council's Annual NPHC Step show to this years Greek Week events. 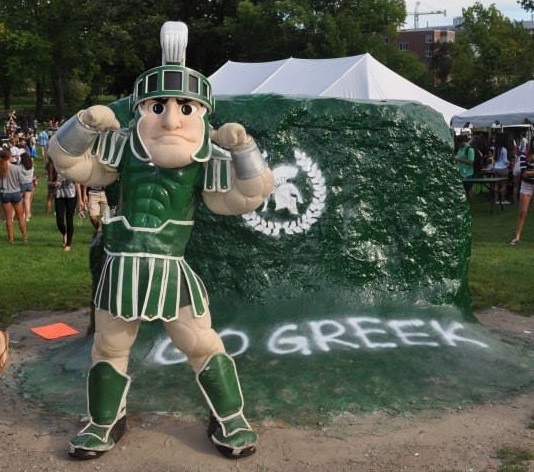 Greek Week is a major highlight for Greek life at Michigan State. Members make a positive impact on many different organizations. This year each Greek Week Team has chosen a local charitable organization that they will be benefiting. Michigan State University is home to 63 fraternities and sororities that are governed by four different councils. Aiming to promote leadership, self worth, and lifelong friendship, these chapters provide opportunities for over 4,000 students here at MSU.